Seward Highway at Tudor, after repairs. 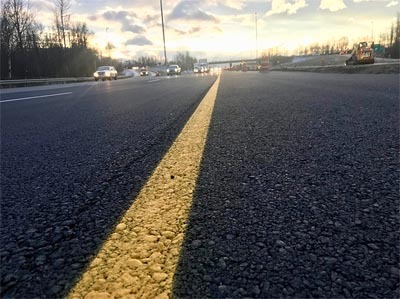 (ANCHORAGE, Alaska) – With the restoration of the Glenn Highway northbound and southbound lanes early this morning, essential travel routes have been restored so normal activities can start to resume. Alaska Department of Transportation & Public Facilities (DOT&PF) Commissioner John MacKinnon has been briefing Gov. Dunleavy on ongoing repair efforts. The Friday 7.0 earthquake struck at 8:29 a.m. and caused property and infrastructure damage. The Glenn Highway Mirror Lake site was particularly difficult to repair because it was a set of two large sink holes that encroached into the northbound and southbound lanes. Subsequent aftershocks expanded the sloughing well into both lanes. DOT&PF is confident that the temporary repairs have been completed will ensure the safety of the traveling public. Winter construction is particularly difficult, soils are frozen, and paving and painting is challenging. Additionally, these repairs are focused on restoring travel, and are not expected to have a 20 year life cycle, which is what the state expects from typical highway construction. While the current focus of the repair work is to restore essential travel; the department will pursue permanent repairs next summer. Typical summer construction has longer life cycles, including paint, paving and guardrails. The department will continue identifying damage sites, make repairs and plan for permanent fixes.